Bullseye glass is known for products that fuse together reliably, and for its rainbow of colors. But now, fewer colors are available. The art glass world looks a little less colorful. 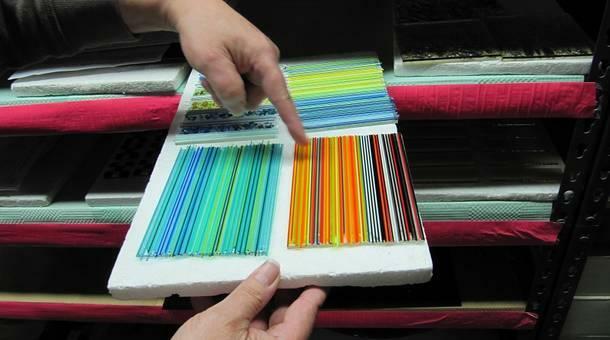 Two glass fabrication plants in Portland, Oregon have stopped production on a range of popular colors in the face of a pollution scandal. Neighbors have filed a class-action suit against one company. The suspended shades are made with certain heavy metals. Portland artist Catharine Newell stands in her home studio. She sprinkles a layer of golden yellow sandy stuff over a square of sheet glass. "So basically,” Newell explains, “I've sifted the powder onto the panel, wearing a mask. Sometimes I’ll use a bit of cardboard, poster board to sweep it across." Newell's supplies come from Portland-based Bullseye Glass, an industry leader in art glass. In early February, Bullseye and a Portland competitor, Uroboros, suspended dozens of colors — including Garnet Red, Spring Green and Burnt Orange — after environmental testing revealed unhealthy levels of cadmium and arsenic nearby. The effect on the global supply of art glass was immediate. Brenda Page runs Blue Dog Glass, a distributor in Victoria, Australia. She says that only days after news broke, she “started to notice a lot of increased buying in the colors that were suspended." Page says she has pretty much sold out of reds and yellows. She has one more shipment coming — there's no telling when she'll get more. Bullseye's specialty is sheet glass — the kind that’s baked in a kiln. Some makers in China do offer similar product lines, but Shawn Waggoner of “Art Glass Magazine” said what sets Bullseye apart is rigorous product testing to make sure its colors fuse reliably. "To have a line of glasses,” Waggoner explains, “that you could fuse together without experiencing breakage was pretty groundbreaking." So it appears many artists will wait for Bullseye to deal with its emissions problem. Catharine Newell said it has been on her mind. “You know, having to adapt to what is available — that's always a good exercise,” she said. “But I think after a while, things would begin to feel very narrow." For now, artists said they're thankful cobalt blue is not affected by the moratorium.